Usually, Tuesday Tips focuses on self-improvement; it’s a column about getting better, both as a player and as an overall individual. The reality, though, is that there are some times when change is needed from others on your team. Issues with teammates can come in a variety of different forms: everything from poor sportsmanship and spirit of the game, to deficient critical technical skills, to personality and temperament off the field. Maybe there is that one teammate whose attitude just makes every other squad hate to play against you. Maybe you have a very talented linchpin player who is consistently throwing the disc away at the worst times. Or, perhaps worst of all, there is a valued teammate who’s exhibiting behavior that creates a toxic environment for the team. Every ultimate player, and indeed every person on this earth, can relate. Whether it is in the world of education, business, or sports, there are individuals — often important individuals who have been in their position a long time — who are either reluctant or oblivious to the need to change. How often have you heard a teammate shake a head and say, “Well that’s typical so-and-so?” The challenge is to find a way to shift the mindset and behavior of these people without creating new problems. Improvement and change, both large and small, are possible, but not if it’s expected to happen automatically. Rather than trusting that people will recognize issues and shift their habits on their own, you need to take action to help your teammates and improve team culture. Here are three ways to approach teammates who need to adjust their behavior. It can be frustrating and perhaps even a little passive to consider it, but often the easiest ways to make changes in individual teammates is to reemphasize team values together at practice. In other words, if you see a problem with one individual doing something that isn’t jiving with team strategy or culture, use the leadership to make it absolutely clear, to the entire squad, what is and what isn’t acceptable. This can be articulated and reinforced in everything from a specific huddle talk, to dedicated drills, to emphasis points during scrimmage or practice. This is the lowest risk option, and also the most collaborative and clear. 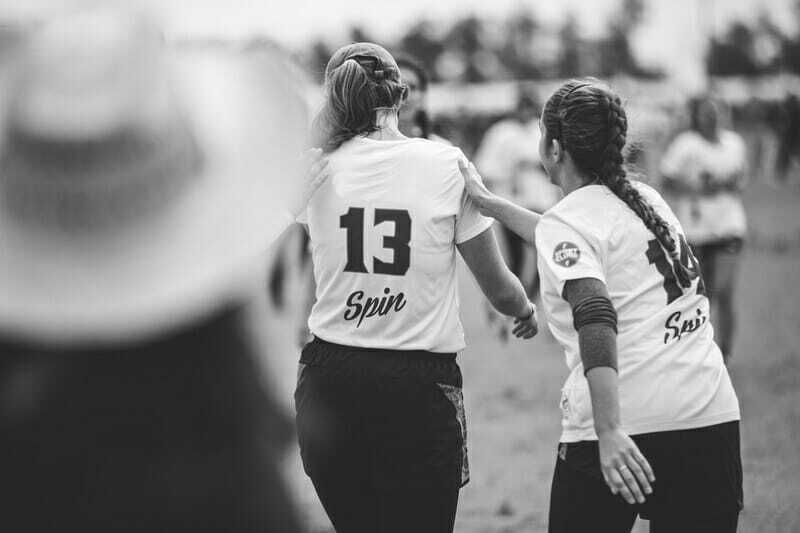 The captains, coach, as well as veteran core can get together and say, “This is what we stand for.” That might be something as simple as swinging the disc on stall six or as complicated as being respectful to your teammates when at group gatherings. Addressing the issue as a full squad is the best option if you personally, or a teammate, is worried about how another individual might take criticism or correction. It’s especially useful for individuals who might have been on the team a while and may be set in their ways. However, there are downsides to this particular course of action. First, it can be time-consuming, commanding valuable practice time when the team may be desperate for the most valuable commodity of minutes and hours to work on other parts of their improvement. Second, while a general announcement and focus may make for clear values, it only indirectly addresses the root of the problem, namely the individual. In many cases, these people know the values of the team and are either unwittingly or purposefully violating them anyway. Having team meetings, setting specific practice goals and purposes, and doing targeted drills and scrimmages can help make the large group aware of what needs to change, but it is really best to have repeated instances to reinforce these models. In short, this is a better option for a general reminder or practice of a concept, or to change behavior if it is a issue with multiple individuals. PROS to this option: Clear. Impacts multiple individuals. Low risk of inter-teammate strife. CONS to this option: Time-consuming and passive. May not deal with specific problem. RECOMMENDED for: General reminders or very important issues with multiple teammates. The middle ground for addressing issues, utilizing small groups can create opportunities to achieve meaningful impact without dedicating extremely valuable time of full-team practice on the issue. These are definitely the best avenues for changing skill or strategic on-the-field issues. Pod workouts or mini games can be great methods for this because there is nowhere to hide. If a player is making fundamental mistakes or not following team schemes, it will become quickly apparent. If someone needs to work on their break throws, hucks, or even ability to go up and catch the disc in the air, there might not be time to do that in practice. Throwing sessions, workout sessions, and the like, however, are the perfect moments. Set up drills yourself, look up information online, and encourage a conversation with teammates to improve! The small group format still allows for general teaching and emphasis. For example, at a small group workout you can mention the need for staying tight on the resets, without having to go to the point of specifically calling out one individual. Opening up the floor to a small group discussion can make it seem like everyone is on equal footing. Be aware, though, you might need to continually remind the group to hold to these ideas, as they won’t hold quite as much weight as if spoken in a huddle at whole-team practice. Small group gatherings of close teammates can also deal with off-the-field or team culture issues, but it can get a little trickier. You want to make sure that a person doesn’t feel ganged up on, and that it is an open conversation, rather than an ambush. Conversations and renewed improvement can happen along the way, if done carefully and on an equal footing with teammates. PROS to this option: Great for skill drills and skill improvement. CONS to this option: One individual might feel surrounded or ambushed or miss the importance of the point. RECOMMENDED for: On-field skill improvement especially. The most direct and straightforward way to inspire change in your teammates is to have a conversation with them. Sometimes all it takes is a simple reminder, player-to-player, about what the team needs from each individual. If phrased correctly, this can be given as a tip or a recommended piece of advice. If that’s not enough, a good method is to ask the teammate for any feedback for you, in the hopes you might be invited to offer some in return. But this approach has a lot of risks, on both sides. For one, you might feel uncomfortable talking to a squadmate, especially if this is an issue that has affected you personally. For another, the other person might feel offended or dismiss your concern. You don’t want your personal relationship negatively affected by this if it at all possible. If possible, try to keep the mood calm and light, and focus on nudging your teammate in the right direction. A better plan might be to ask the leadership to have a conversation with a teammate on this front, especially if you feel it is paramount to you or the team. While a conversation with the captains or coaches can lead to confrontation and can have a negative impact, if it is a serious issue, there may be no other choice. A strong option, but one to be approached delicately, conversations off-the-field about ultimate can often be relationship changers. When done well, they deepen and strengthen the bonds of team, but unfortunately there can be the opposite effect occasionally. PROS to this option: Most direct. The individual will get the message and probably follow it. CONS to this option: Can create conflict. RECOMMENDED for: A serious off-the-field issue. Remember there are multiple avenues for inspiring changes from your teammates. Setting and group size can matter greatly to the effect of the approach, as it will set the tone and target of the change and improvement. Larger groups will make the issue clear among the team in a low-risk environment, but may miss the mark for a certain individual. Individual conversations will hit concerns head on, but might create inter teammate conflict. The middle ground is to have small group conversations or skill sessions to make improvements. Ideally, multiple avenue of attack can be the best approach. Along the way, constantly be self-reflective and seeking out improvement for yourself. Remember, judge not, lest ye be judged. We can all improve, and while you may see critical areas that need to change in others, they may see the same in you. Being proactive for yourself can help create that desired culture where everyone is constantly looking for their own personal improvement that fuel positive team outcomes. Comments on "Tuesday Tips: Three Approaches For Inspiring Change In Your Teammates"